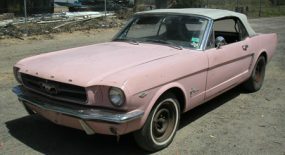 I love a bit of history so here’s a Mustang find I just had to post about. 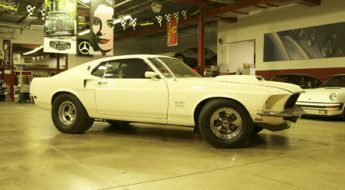 Here we have an original unrestored 1969 Boss 429 Mustang. What’s more it’s a sought after S engine version. 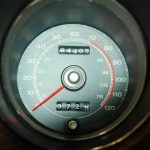 The car was bought from it’s original owner who had stored it in his garage with only 4,405 miles on it. 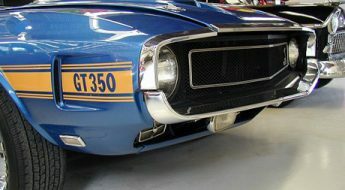 The car was originally raced three times in the stock class. 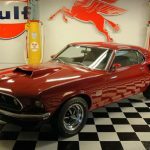 As clean, unrestored cars are very rare and sought after this one is on eBay with a whopping price tag of $550,000. If you fancy dropping some cash on this get in quick, you’ve only got three days left. 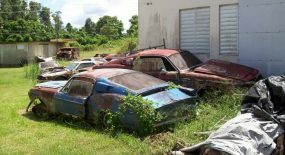 As we all search for the best Mustangs experts agree that an unrestored car because it is so rare and cant be duplicated is the most sought after. 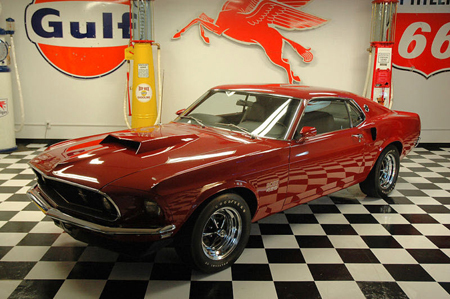 This car is a one owner, red Boss 9 with the most sought after S engine which only came in the first 279 Boss 9s.I bought this car from the original owner in Akron Ohio he stored the car in his garage the whole time and only drove it 4,405 miles the first few years he owned it. The original owner is still alive and well and can be called to verify anything on this car that you want. He wrote up the history of the car and I put it in one of the pictures which I think it can be read. When he first bought the car he raced it three times in the stock class and the three class winner stickers are still in the quarter windows right now. I have the original window sticker that has been wrinkled a little but is otherwise in very good condition. I have two mint build sheets. I put a picture in here that shows both build sheets taped together when I found them in the car. There is also a picture of the floor pan which is like brand new. The only odd thing under the carpet was a gum wrapper, screws, bolts, cut out from the dash and many other items the Ford employees left under the carpet. I kept all of these items and they almost filled up a baggie. I also have the temp warranty card and the regular warranty card with the owners name and address. 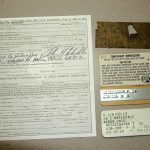 I also have a lot of other paper work with the car such as registration cards from 69-71, sheets from Kar Kraft when the engine came in and many more. This car was in excellent condition when I got it and basically we wanted to get it running and all cleaned up. We took the seats and carpet out and cleaned up everthing very well. Took pictures of the build sheets and then put them in the file. Everything is original in the car. 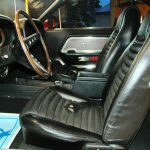 The carpet is original to the car and in excellent condition the seats are excellent with no damage of any kind, the dash, door panels and headliner are also in perfect condition. There is a Boss 429 plaque glued to the dash. Ford would give this plaque to car owners that filled out a questioner and send it back in which this is rarely seen. This has the original rim blow steering wheel which has no cracks and in excellent condition. I took a picture of the odometer which shows only 4,405 original miles and you can still call the original car owner to verify this. 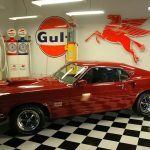 I have one picture of the car in the garage where I found it in 2007 then I have a picture of the car at Bob Perkins when I was cleaning it up and it is still wet just to show how nice of condition the car was when I bought it. The underside of the car according to Bob Perkins is the nicest bottom of a unrestored car that he has ever seen. This car was ziebarted when it was brand new and likely that is what kept all the parts so nice. We took off all the parts on the bottom of the car and took mineral spirits and cleaned the ziebart off and then reinstalled them. As you look at the bottom of the car you can see the engine was not repainted but looks very nice. The original upper and lower control arms look like brand new. I took one close up picture of the spots welds and many of them you can still see the heat marks from when the factory spot welded them 40 years ago. This has the complete original exhaust from the manifolds all the way to the tail pipes. We did rebuild all the brake system just in case someone wanted to drive the car. All four shocks are original and still in excellent working condition with the original orange marking paint still on them. The original gas tank was covered with ziebart top and bottom and with a towel and mineral spirits it was all cleaned up and it looks like brand new. 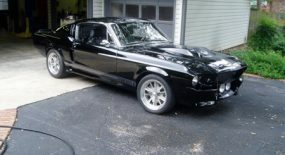 Absolutely everything on the bottom of the car is original and in excellent condition. There is not one drop of rust anywhere on the car. We did put a thin film of a waxy product on the bottom so nothing would get the surface rust on it in the future. The outside of the car is all original paint except about 25% of one quarter was touched up because it had a small crease in it. The paint finish is smooth and shiny. There are some small stone chips and the normal items on the car but there are zero dings or dents in the car. In the door jams there are some small yellow buttons where ziebart undercoated the car many years ago. This car still looks very nice up close but is not flawless. All four tires are original and in excellent condition. Three of the tires came with the car and the fourth one he had a blow out so I had to buy it from Ed Meyers for a cost of 3,500 dollars for one no size original tire that looked almost like brand new. These tires have no cracks and have most tread just like a car with 4K miles on it. I wouldn t use them to drive long distance but at a car show or something would be fine. Also all four wheels and center caps are original to this car and in excellent condition. The lug nuts which on a 69 only are a two piece system are still in excellent condition and all accounted for. The bumpers on the car and all chrome has never been redone and it is not pitted and as nice as new. All original glass and stainless also. In the trunk of the car it has a original trunk mat, original 7.75-14 spare tire which is very rare, original jack, handle and inflator bottle. Also it has an original battery and battery caps which you never see on these cars this is extremely rare. Of course the battery is 40 years old and so it doesnt hold a charge but would be for show purposes only. Absolutely everything in the trunk is original. Under the hood is the massive original engine which has never been rebuilt or repainted. 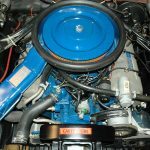 Because I wanted the car to run we took off the water pump and had it rebuilt and we had to repaint the water pump, also we took the heads off and put in nos original o rings but used the original fire rings over. The master cylinder was also rebuilt for safety purposes. The carb which is a correct dated original carb also had to be rebuilt in order for the car to run properly. The air cleaner is original and never has been painted also the snorkle is original and never has been painted. All hoses clamps and other items are original to the car and only have been removed and cleaned up and not repainted. The only items that we rebuilt were safety items so that the car could be driven if the new owner liked. Even the radiator cap is original to the car which is super rare also. You wont find one item on this car which is not original. If you do I will replace it. The engine doesnt look perfect because the items on the engine were only cleaned up and then put back on no media blasting no painting just cleaning them up. I paid a lot of money for this car when I bought it. It wasnt just a lucky thing where I found it and the original owner didnt know what he had. Then my shop probably spent another 1,000 man hours cleaning and detailing this car. Then on just the few parts I had to buy I spent another 25,000 dollars on the one tire, the battery, the trunk mat and a few other key items that are super rare and very expensive. I am not looking for offers on this car. 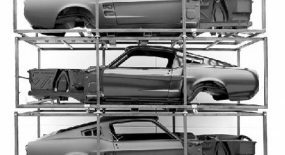 I will however take several cars on trade in but I will want at least half the value of the car in cash or cashiers check. 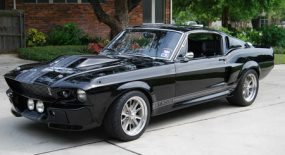 This will be the only car like this you will ever have the chance to buy and most people wont be able to afford it. There are people out there that are looking for the best Boss 9 you can buy and this is it. There are no secrets and there are no parts missing. 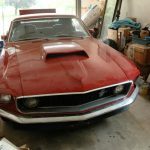 If you know either Bob Perkins or Ed Meyers you can call them up and ask them about this car. They have both seen it and Bob Perkins worked on it a great deal. This is an all original cleaned up Boss 9. 1969 is the most sought after year, red or black are the two most sought after colors, the S engine is the most sought after engine and an unrestored car that looks very nice and not like a daily driver is the most sought after car. 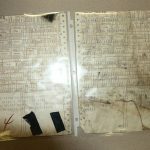 I have all the documentation, the original owner can still be talked to for verification. I probably have 500-1000 pictures of this car before the clean up, during the clean up and after the clean up which will all go on a disc and go along to who ever buys this car. 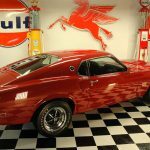 my dad has a boss 429 a 351boss & a 302boss mustangs and several shellby mustangs he would of loved seeing the car you have found.I lost my dad to cancer 12/16/2010 every car we have of his are in as good of shape as the car i just read about of yours it truly is a prize. keep up the good work.